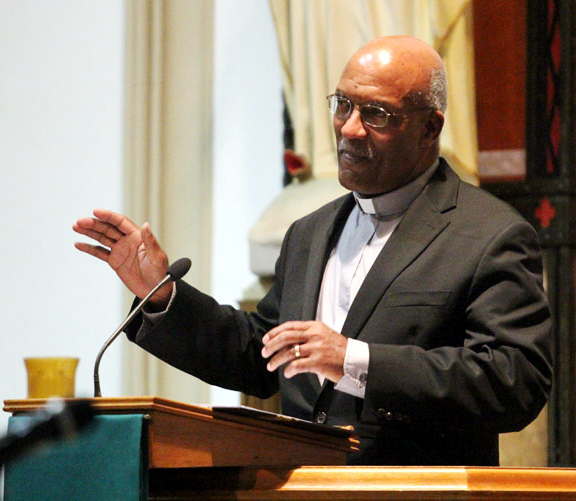 It was the 33rd annual Archdiocesan Prayer Service honoring the legacy of Dr. Martin Luther King Jr., which was held at St. Katharine Drexel Church in Chester on the evening of Jan. 18. The featured speaker was Rev. Cean James, founding pastor of Grace Christian Fellowship Church in Philadelphia. 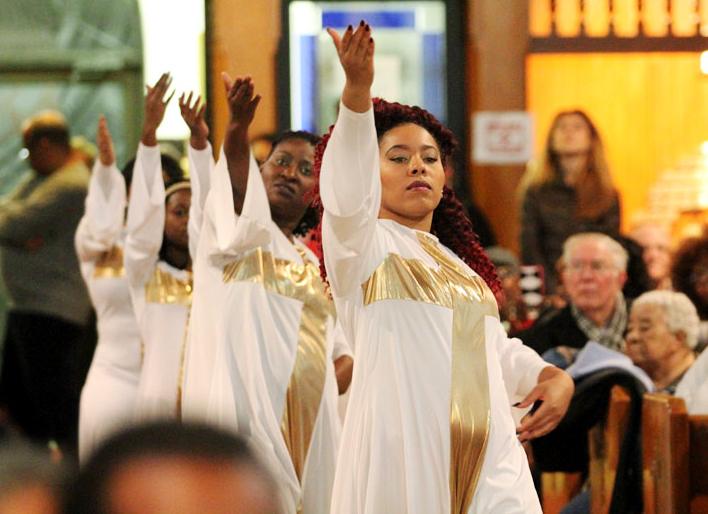 It could well have been Dr. King himself, because the joy-filled exuberant singing of the superb Philadelphia Catholic Mass Choir, an archdiocesan-wide African American choir under the direction of Kenny Arrington, could surely raise the dead. Rev. James began his talk by revealing past family experience with the Catholic Church. His grandmother was Catholic and when his father was an infant he was deathly sick and sent home by the doctors probably to die the same night. Instead his mother took him to the rectory of Chicago’s St. Ignatius Church, where the pastor and the nuns prayed over him through the night. Rev. James’ father recovered and in gratitude his mother named him for the pastor. The rest of his talk was pure fire. He does not take to the notion that Dr. King’s birthday should be celebrated as a day of service. Rev. James had special scorn for those politicians who might go to a school and paint a wall on Dr. Martin Luther King’s birthday and then vote against funding for schools the next day. On the other hand, the theme stressed by Deacon Bill Bradley, director of the Office for Black Catholics and Father Thomas Whittingham, pastor of St. Katharine Drexel, was the spirit of charity, as expressed by the spiritual and corporal works of mercy, which the congregation was urged to study, ponder and practice throughout the year. Both messages were absorbed by the congregants. 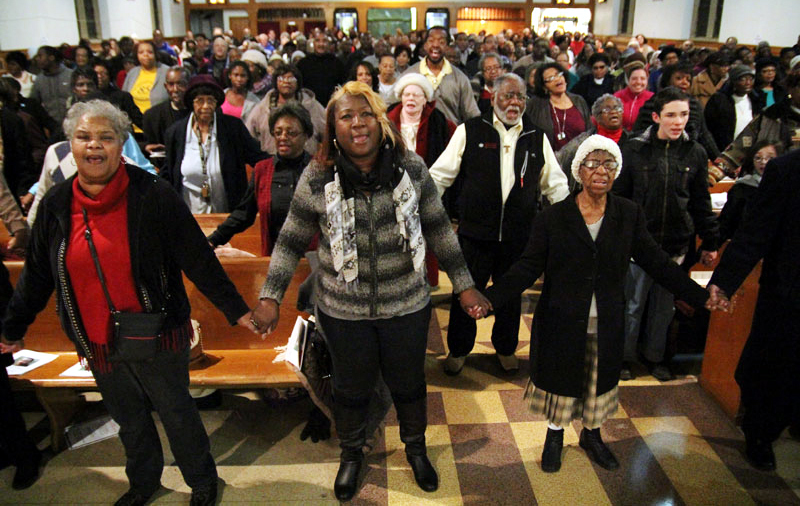 For Allison Walker, a member of St. Barbara Parish in West Philadelphia, the evening was an example of the good work being done by Deacon Bradley and the Office for Black Catholics. “It was phenomenal having us all come together praising the Lord and giving praise to Dr. Martin Luther King Jr.,” she said.